OK well we were watching the tank last night and she is still digging away down there. Iam pretty sure the other crabs are laying on her right now! She never came up for more food and still has not molted. This is all normal? She could be preparing sometimes They go up and down for a few days before actually digging a nice cavern to molt in. Fudge is right all the way around. She could be digging just to dig. Crabbies dig for many reasons. They dig to reach comfortable conditions (humidity, temp, etc), they dig for fun, they dig to find a protected spot away from other crabs, they dig to just chill out and they dig to make a molting nest. They like to create their own special little burrow where you may see them dragging food off to stash. The only way to "know" they are molting is if they just don't come back up for a while, & even that isn't always a guarantee. Like Fudge said, just make a note of when she went down & try to hope for the best. My big baby Godzilla's last molt was only 6 weeks, but this time, he has been down since late December & still hasn't come up! Gamera molted on the surface in mid January, yet I have only seen him a couple times since then. Sometimes, they just hide. I got two of my hermit crabs at the beach too. One of them was dead the next day! They told me all the wrong things. The most wrong thing was that they made me dig up sand from the beach! We went to petsmart (a pet store here in Jersey) and got three more. She told us all the right stuff and I am learning more. Did they tell you false stuff too? Generally pet stores are misinformed when it comes to hermit crabs. All they know is that you put them in a tank with food, water, and something to hide under and you're good to go. It's always best to do some research before getting a new pet - but we don't always think about it. Most of the time when I go to a new pet store for the first time or if it's the first time being waited on by a certain employee I ask them what they know about hermit crabs and how to care for them... it's sometimes horrifying to hear what they have to say. I had one tell me they shed their shell and that is how they get bigger. When I asked if they meant Exo they said no their shell. The shell that they grow on them when they grow older. O__O Another told me that they are okay to be fully submerged in water or to be left out on wood chips in a wire cage. They have told me you should only feed them the dry pellet food because anything else is bad for the. Also they are not able to eat the pellets unless you crush them into a powder. Well for your petstore horrors there are a few gems. In Newmarket, Ontario there is a Petsmart that has an employee called Jess. She has been crabbing for years...actually told me of this forum. Great help wonderful person. .....Interesting note ....that PetSmart stores do what the 'vet's' tell them to do with all the animal care. The (mainly) pp's they get get fresh water and food only no salt water. I asked why to another employee...and was told they could only do what they were told to do for each animal in their care. That's how it is around here, too. 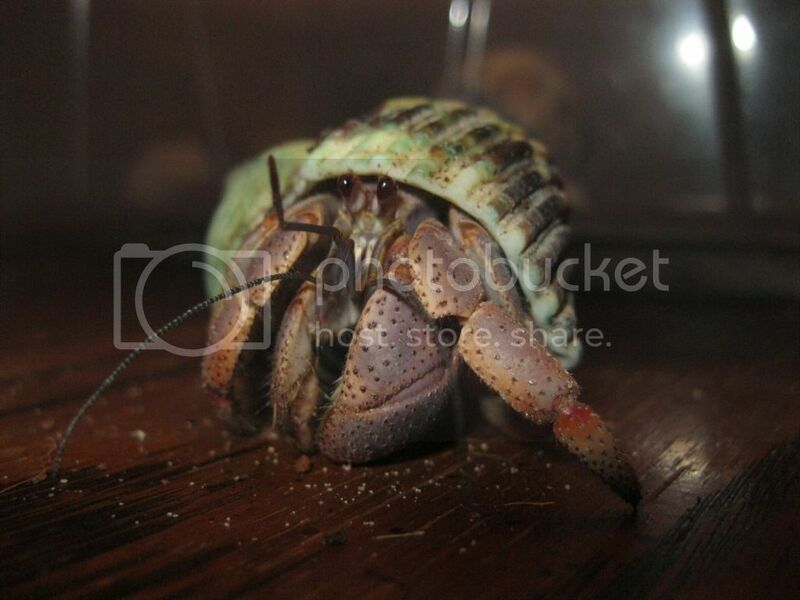 It doesn't matter if the employees/managers listen to you and think you're right about hermit crab care. They can't change anything without going through the corporate office. When you contact corporate all they do is send your complaint/suggestions onto the store manager who will then tell you they can't change anything unless corporate approves it. It's a never ending circle. Yeah, that's pretty sad. That's why we need to work on the companies themselves. If we appeal to their business side & explain how much more money they could make, it might work. There are people out there who are afraid to make a stink because they think that by drawing attention to hermies, it will cause having them to be outlawed. I say, "BALONEY!" People all over the world own exotic animals that have been captured in the wild and that hasn't been outlawed, and there are laws to protect THOSE exotic animals, so why not hermies? If a pet store kept a puppy in a box with dirty water, nowhere to sleep and only dry crappy food, the place would be in trouble. Why should it be any different for our non-furry friends? That's a good idea! Ya know, I was thinking too that if we even.....gulp....got places like HCA to co-author it with us, it would hold more credibility than just us alone. The only thing is, HCA won't do that. There are people there who would agree that it's a good idea, but you won't get a seal of approval from the mods/owners. I mean, I've talked to all the family owned pet stores and they've changed. It's just the big chains that I can't seem to do much about. I send in my complaints and suggestions (presented in a way that what changes I'm suggesting they make will save them money) every time I visit the chain stores, but I've gotten to where I just don't go unless I have to. People are still going to buy hermit crabs from them no matter what. They're still making money. Unless something happens that lowers their profit - they act like nothing is going to be done. But, they have been making changes over the years. Slowly. It's just a matter of keep bringing it up and don't stop. You're right all the way around and you have no idea the Grinch-like smile I got at what you said about HCA. Go read the archives I know alllllll about how the game runs over there all the way to the top, hh. I just realized in my sleepy stupor when I wrote that I wrote right instead of write... it was the first thing I noticed when I read through this. I am ashamed of myself. heheh. It would be nice if we could get someone big to co-author the letter but you never know we may still be able to persuade them ourselves. I was actually writing up some rough drafts on something. I know they could be making MORE money off of the crabs is they actually cared for them better and told people the right things they need. You would think that even though right now they aren't loosing money they would still like to know how they could be making more.